Children Comprehensive School Safety (CSS) Curriculum Integration in D.El.Ed. Course Two days training to Key Resource Persons on CSS curriculum from 2-8-2018 to 3-8-2018 at Vijayawada complete details as per Proc.Rc.No:142/B/C&T/SCERT/2018, Dated:27.07.2018/Children Comprehensive School Safety (CSS) Curriculum Integration in D.El.Ed. Course Two days training to Key Resource Persons as per Rc.No:142. AP SCERT Disaster Management Save the Children Comprehensive School Safety (CSS) Curriculum Integration in D.El.Ed. Course Two days training to Key Resource Persons on CSS curriculum from 02-08-2018 to 03-08-2018 at Vijayawada Deputation of resource persons as per Proc.Rc.No:142/B/C&T/SCERT/2018, Dated:27.07.2018. 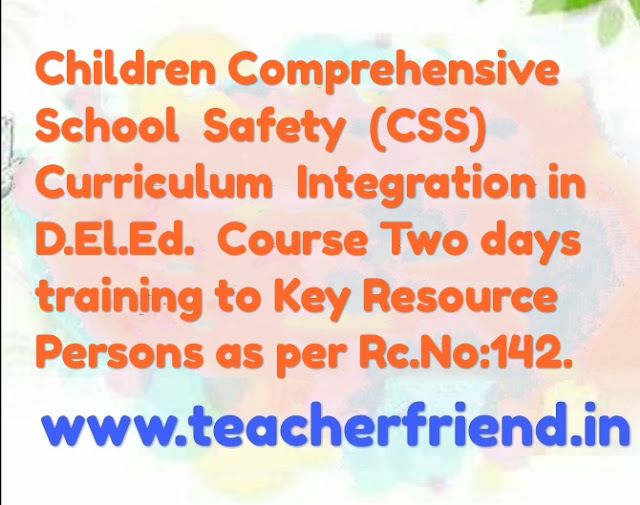 Children Comprehensive School Safety (CSS) Curriculum Integration in D.El.Ed. Course Two days training to Key Resource Persons as per Rc.No:142. Save the Children Organization would like to conduct training for DIET faculty and Key Resource Persons on operationalization of Comprehensive School Safety Policy in School Curriculum. The training may give more insights on the importance of school safety. The purpose of the training is incorporated in the school curriculum which was considered as first School Safety Curriculum in the country. The proposed programme will make DIET faculty and Key Teacher Resource Persons to understand the key components of CSS and to equip them with adequate knowledge and skills on CSS to make an effective classroom transaction at school level to shape up our schools to be more resilient.Participants are proposed from DIETs, Key Teacher Resource Persons and selected teachers from district Save the Children project schools. Two day Key Resource Persons training programme on CSS curriculum is scheduled from 02-08-2018 to 03-08-2018 at Hotel DV Manor, Vijayawada, accommodation will be provided at Hotel Swarna Palace, Vijayawada. Headmaster, 4 strong teachers) programme. All the District Educational Officers and DIET Principals are informed to identify the faculty and depute the above said training programme, and also instruct them to report course Director at the venue by without fail. The TAIDA, accommodation will be provided by the said organization.